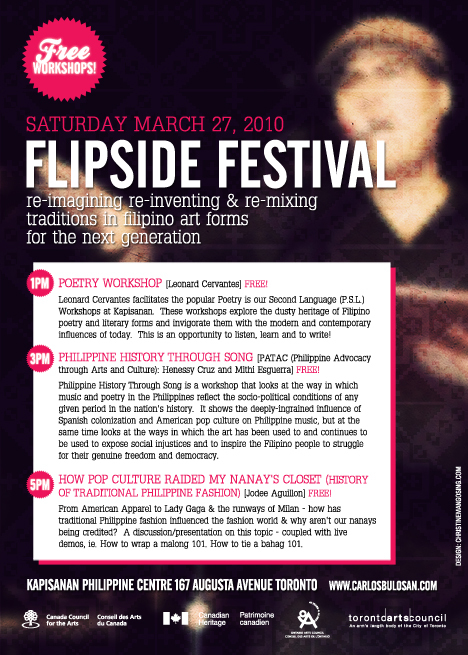 Part of the Flipside Festival, we are having FREE WORKSHOPS on Saturday, March 27! Leonard Cervantes facilitates the popular Poetry is our Second Language (P.S.L.) Workshops at Kapisanan. These workshops explore the dusty heritage of Filipino poetry and literary forms and invigorate them with the modern and contemporary influences of today. This is an opportunity to listen, learn and to write! Philippine History Through Song is a workshop that looks at the way in which music and poetry in the Philippines reflect the socio-political conditions of any given period in the nation’s history. It shows the deeply-ingrained influence of Spanish colonization and American pop culture on Philippine music, but at the same time looks at the ways in which the art has been used to and continues to be used to expose social injustices and to inspire the Filipino people to struggle for their genuine freedom and democracy. From American Apparel to Lady Gaga & the runways of Milan – how has traditional Philippine fashion influenced the fashion world & why aren’t our nanays being credited? A discussion/presentation on this topic – coupled with live demos: How to wrap a malong 101. How to tie a bahag 101. Carlos Bulosan Theatre is committed to creating innovative work that reflects a vibrant, new generation of Filipino-Canadian artists. CBT seeks to encourage and develop Filipino-Canadian actors, playwrights, poets and other artists within the community. ~ by cpnivera on March 5, 2010.